Several manufacturers claim to have “steerable” ceiling microphone arrays. This sounds impressive, but it is a useful function normally powered by the mixer. The proprietary Biamp Devio and Tesira, the proprietary Polycom HDX (with Polycom DSP), and now the new Audio Technica ES954 Ceiling Mic Array are all referred to as "steerable,” but what are the competitive differences regarding "steerability" when compared to ClearOne CMAs? Although the original CMA is still a great choice for small coverage areas like huddle spaces with our CONVERGE® Huddle, let’s focus on the new tear-drop shaped CMA capsule. This capsule covers a wide footprint, but it’s also important to note that it covers the vertical space from directly below to about 70 degrees to all sides for 140-degree vertical coverage. To make the CMA array "steer," it needs to sense where the talker is and open the capsule toward them, as well as mute the other capsules in the CMA. The ClearOne DSP does an excellent job of doing this using the First Mic function, and the MON and Gating settings can enhance that. 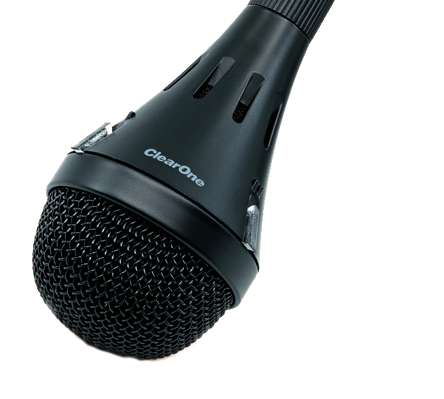 Plus, with ClearOne’s great AEC and Noise Cancelling horsepower, you can make that open mic sound sweet. It’s important to note that since third-party DSPs have many of the same functions, they can also make ClearOne CMAs "steerable." Between the unique features of ClearOne CMAs—such as numbered elements and LEDS—plus great coverage and impressive audio specs, these products can go toe-to-toe with any of the other CMAs on the market. Sign Up for the latest ClearOne news!